This is a species that can adapt to living in salt water and estuaries. At night, it feeds on invertebrates and small fish that live in the deep sea and, during the day, it like to stay buried in the sand. Size, the giant oceanic manta ray is bigger than the stingray. The position of the mouth: the stingray’s mouth is on the lower part of its body whereas the giant oceanic manta ray has its mouth on the front. Only the stingray has a thorn on its tail. Up to 2 meters long (6.5 feet). 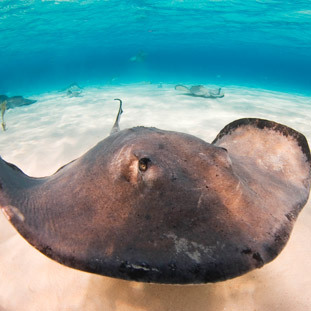 In Ancient Greece, dentists used the poison from the stingray thorn as an analgesic.